I went into Forbidden with low expectations. It was one of those books that sounded like it could be amazing, and so I went into it expecting a book that didn’t meet expectations. That sounds a little twisted, I know, but I figured if a book sounded this good, then it probably wasn’t going to be. So to say I was pleasantly surprised by Forbidden is putting it simply. Claire is a normal 17 year old girl who starts to get strange visions of past and future events, as well as mysterious messages from someone she doesn’t know. Just as all this starts to happen, Alec shows up. While Alec isn’t the cause of these new, strange occurrences, he doesn’t have an explanation. As Claire and Alec begin their romance, they soon discover whatever they feel is forbidden. The story itself doesn’t sound completely unique. Boy meets girl. Angels are involved. Boy can’t date girl. However, Syrie and Ryan manage to make a unique story out of an ordinary plot. There are enough twists and turns to keep things interesting. Plus, the spin on angels is a little bit different and it really works to set the novel apart. Claire is a teenager and she acts like a teenager, albeit a mature one. She does the typical teen thing, although she thankfully doesn’t fall into the love triangle trap. She has amazing friends and, here’s the shocker, she actually works to keep them in her life after things start to change. For some reason, in a lot of Young Adult paranormal novels, the friends from the beginning are slowly cut out of the picture and that always bugs me. Erica and Brian don’t let Claire push them aside, and Claire makes sure to include them as she tries to figure everything out. I wish we got a little bit more of Alec characterization. He’s a fantastic guy and does have his swoon worthy moments, but he’s not different. There’s nothing that really sets his apart from other Young Adult male leads. He’s written well and he’s a sweet guy, but I feel like I say that about every guy. I could have gone for something a little different. There were a few other moments when the novel just seemed to get choppy all of a sudden and there were a couple times when phrases or sentences just felt weird or out of place, and those are the only things holding me back from falling completely in love with the story. 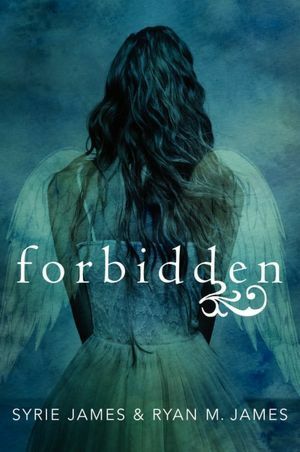 As it looks right now, Forbidden is a single novel, even though the authors have more to write. I really hope this changes and there will be more Claire and Alec to read in the future. I want to know what happens to these two. This entry was posted in Something a Little Different, Young (and New) Adult and tagged Fantasy, Paranormal, Ryan M. James, Syrie James, Young Adult.